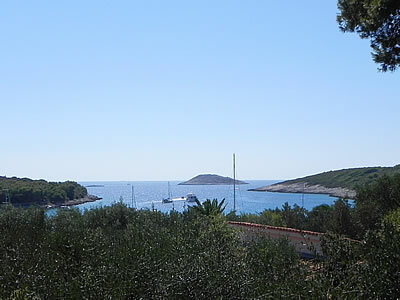 The Pakleni otoci lie off the south coast of Hvar, towards the western end. It’s a short expedition by boat to visit any one of this chain of islands, just take your pick from the choice of excursion vessels and taxiboats lining the waterfront in Hvar town. For those with their own yacht, of course, sail right on over! The islands appear to be a little touch of heaven for pottering around in small boats, there are so many inlets and secluded coves to explore. There are famous beach night clubs out there too, I believe, though I’ll leave it to other people to blog about those! Personally, I was keen to visit Palmižana on Sv Klement for a couple of reasons – firstly for Meneghello’s art gallery and restaurant, and secondly to see an ancient Roman maritime villa. Pakleni otoci is sometimes translated as “Hellish islands”, though the islands are really named for paklina, the pine resin used for making tar to coat the old boats. There are 16 islands in all, the largest of which is Sveti Klement. They’re listed as uninhabited, which is to say nobody stays there through the winter. In late summer it’s idyllic, calm and peaceful. On the boat over, I discovered a problem with my camera. No card. It had been taken out to transfer photos and was still in the card reader back at the house. Oops! Though that was not my exact words at the time, you understand. Still, at least the camera has a limited memory, so there are a few photos to accompany this blog. Ah well, that means we’ll have to go back again, then – what a shame! The excursion boat arrives into the ACI Marina in Palmižana. There weren’t many boats in, which surprised me, given the size of the Vrboska marina. I guess that’s because nobody keeps their boat permanently in Palmižana, it’s just for transient parking. One thing I’ve noticed about the sailing holidaymakers, they generally seem to hit Hvar mid-week, since they set out from mainland ports. I also hear that in the height of summer, this place was bustling. The walk to Meneghello’s takes you up and over the narrow neck of land between the north facing marina and the south facing bay. At one time, this was a private summer residence, but since 1906 they’ve been welcoming paying guests to this lovely hideaway resort. The appealingly quirky appearance and bright colours are due to the artistic vision of Dagmar Meneghello, the current owner. Hidden here and there amongst the trees are cottages in bold, tropical hues. 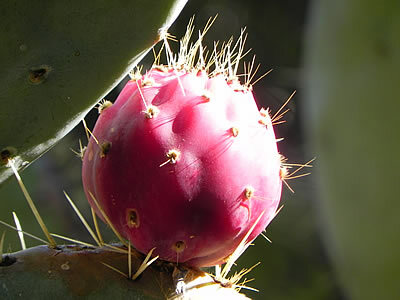 It’s a wonderful blend of the natural dalmatian environment with a classy zing of caribbean spice! Now, I’m not given to beach holidays, but I could see the attraction of spending lazy days here, it looks so relaxing. 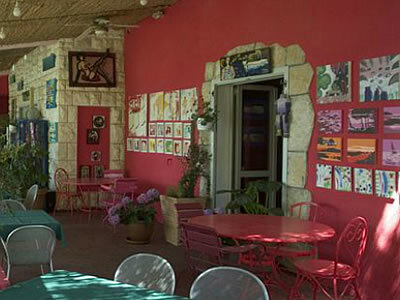 The gallery is part of the Meneghello restaurant, where you eat surrounded by art! Dagmar invites young Croatian artists to exhibit here in the summer months, though as she says, some of her long-term exhibiting artists are now not so young! It’s contemporary art with an edge, which is good to see here. They also bring in musicians, so it’s quite lively of an evening. I find myself wishing I wouldn’t be on the boat back to Hvar before then. 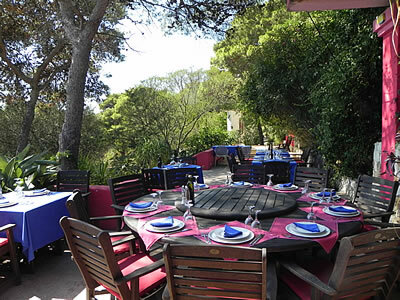 The food in the restaurant is excellent, lovely fresh ingredients perfectly prepared. 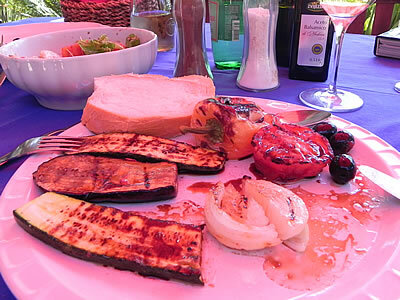 We enjoyed calamari and vegetables cooked on the grill, washed down with a glass of the local white – Tomić winery has a vineyard on St Klement. 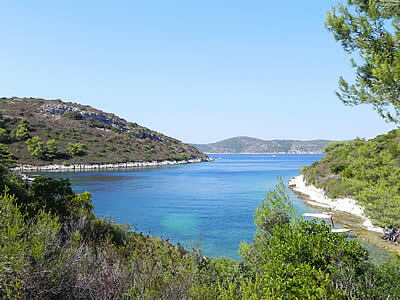 All this surrounded by greenery and overlooking a beautiful peaceful bay. Sigh. After lunch, we had a word with Dagmar about the art. She likes to encourage young artists, and enjoys sharing art and music with her guests here. She travels quite extensively within the European art scene and it’s good to see someone like her with her cultural contacts being so active. It seems to me that Hvar is more of a party town than a cultural centre these days. That’s rather a pity, given its history. Dagmar hosts an open art group on Facebook, link given below, along with other information about this lovely place. On this particularly hot day, we ended up not walking all the way to the Roman villa, that’s for another time. Instead, we simply found a quiet cove for a swim and a sketch before heading back to the boat. 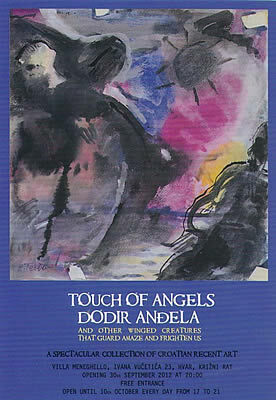 Touch of Angels, an exhibit of recent contemporary Croatian art opens at the Villa Meneghello in Hvar town September 30, 2012, and runs through 10 October. Opening reception 20:00, Sept 30. Exhibition open daily 17:00-21:00. Villa Meneghello, Ivana Vučetića 23, Križni rat, Hvar. ← Are the mosquitoes getting bolder?